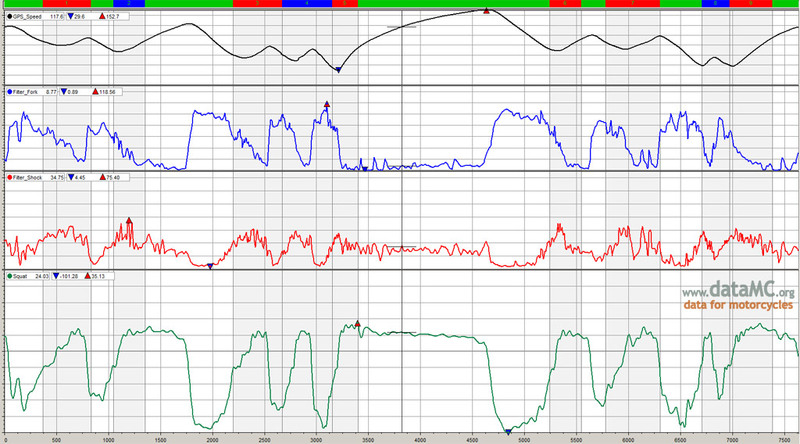 Suspension data for a typical lap showing speed (black), front fork travel (blue), rear wheel travel (red) and squat (green). One important aspect of motorcycle setup, especially as bikes become more powerful, is how the suspension reacts when the motorcycle accelerates. As we have discussed previously in the section covering front and rear weight, load transfers during acceleration and braking and acts to compress or extend the suspension. This load transfer causes the bike to “squat” to the rear under acceleration, and in an extreme example, all the weight can transfer to the rear wheel in a wheelie. Note that this is one situation where it is desirable to use actual front wheel travel rather than fork travel, and the difference between the two values can be noticeable. A positive value for squat indicates the rear of the bike is lower than the front, while a negative value indicates the front of the bike is lower than the rear. The diagram shows a typical lap with front and rear wheel travel along with squat; note how squat is very negative during hard braking, and slightly positive during acceleration. In the squat trace we can see how much and how quickly the motorcycle pitches forward under braking, and how much and how quickly the motorcycle pitches rearward on acceleration. Squat can be affected by a number of variables, including spring rate, preload and damping. Softer fork springs, for example, will give less squat; softer rear springs, more squat. 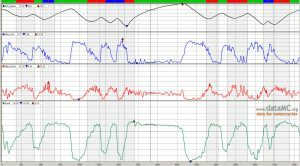 Changing damping settings will affect how quickly the bike pitches forward and rearward, and will change the squat values at different parts of the corner. Additionally, and especially on more powerful bikes, anti-squat plays a big part. Anti-squat is the tendency for the rear suspension to extend due to the chain pulling on the rear wheel and the rear tire pushing the bike forward; this will be explained in more detail in the next post.